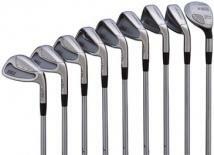 Set includes: 3 i-Wood: 18° , 4 thru 9 irons, plus P-Wedge: 46°. Graphite shaft available in Senior, Regular, Stiff, or X-Stiff flex . 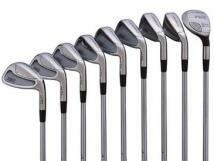 Wedges available in Wedge flex. Available in right- and left-hand models. For Handicaps 10 thru 20. 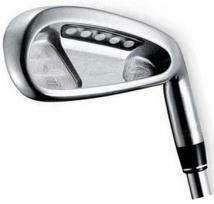 With a unique cavity undercut and heel notch, and top-line width progressively increasing from the short irons to the long irons, weight is gradually shifted away from the face, improving perimeter weighting and forgiveness. A sizeable high COR thin face reinforced with a lightweight carbon weave support, as well as an increasing offset, helps players square the club at impact. The result is an improved feel and longer, straighter shots. SWEET SPOT With a low density carbon weave support, the Di5 features a thin, high COR face to provide a generous sweet spot in a conventional head size. WEIGHT SHIFT Weight in the Di5 is moved from the heel area in the short irons to a lower, deeper position in the long irons where the weight is needed for maximum forgiveness and higher trajectories OPTIONAL HYBRID CLUBS Golfers who require the distance of long irons but desire greater forgiveness now have the option of the immensely hittable hybrid clubs. Hybrid clubs in 17.0°, 21.0°, 25.0°, 29.0° lofts are available individually or as optional clubs in the Di5 set. Introducing the new IDEA a1 Pro Hybrid Irons, An integrated set of irons designed to allow better players to work the ball yet still benefit from forgiving IDEA Hybrid Iron technology. 3 & 4 Hybrid iWoods, Sleek, tour-preferred design with no offset, Low CG, highest MOI of any hybrid on tour, bPull face construction with custom steel face creates lower spin and increased ball speed, Adjustable weight port for swing weight and shaft adjustment, 1 hybrid on Champions and Nationwide Tours, Aldila VS "By You" hybrid shaft - the hottest new shaft on the PGA TOUR, with multiple tour wins, Golf Pride Tour Velvet grips. The all new Ci6 is targeted directly at the mid-handicapper. It looks and feels like a precision players instrument but incorporates some of the more forgiving features of the Wilson Staff line. 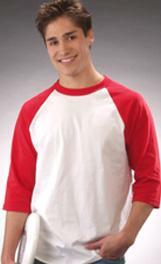 The mid-size head features thin toplines, slight offset and a small undercut cavity. The perfect blend of classic looks and maximum control. Elastomeric Dampening Layer Unique cavity coating reduces vibration by 1/3. Taper Tech Steel Shafts:- A progressive tip design transitions from high tip flexibility in the long irons for higher launch, to a stiff tip in the mid to short irons for a lower launch and maximum control. Features an oversize cavity-back head design with clean, appealing lines, Tuned Performance Cartridge - Delivers high moment of inertia, provides better center of gravity location and provides more efficient transfer of energy to the ball. RAC (Relative Amplitude Coefficient) pockets channel impact vibration to specific locations within the clubhead for outstanding feel at impact. Wide, cambered gliding sole creates additional stability through the impact zone. 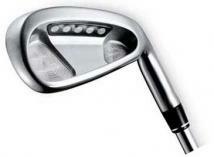 With a unique cavity undercut and heel notch, and top-line width progressively increasing from the short irons to the long irons, weight is gradually shifted away from the face, improving perimeter weighting and forgiveness. A sizeable high COR thin face reinforced with a lightweight carbon weave support, as well as an increasing offset, helps players square the club at impact. The result is an improved feel and longer, straighter shots. Sweet Shots :- With a low density carbon weave support, the Di5 features a thin, high COR face to provide a generous sweet spot in a conventional head size. Weight Shift :- Weight in the Di5 is moved from the heel area in the short irons to a lower, deeper position in the long irons where the weight is needed for maximum forgiveness and higher trajectories Optional Hybrid Clubs :- Golfers who require the distance of long irons but desire greater forgiveness now have the option of the immensely hittable hybrid clubs. 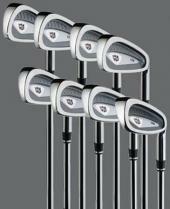 Hybrid clubs in 17.0°, 21.0°, 25.0°, 29.0° lofts are available individually or as optional clubs in the Di5 set. The unique back weighting of the Pi5 design goes from an undercut cavity in the long irons to a standard cavity back in the short irons. This design progressively moves the CG location giving players an arsenal of advantages—from a higher flight with more forgiveness to a lower, more controlled ball flight for maximum shot making capabilities— all with the soft feel of 431 stainless construction. The Pi5 is played on tour by Padraig Harrington and Jesper Parnevik. Sweet Spot: With a low density carbon weave support, the Pi5 features a thin, high COR face to provide a generous sweet spot in a conventional head size. Perimeter Weighting: Each iron in the Pi5 series is designed to move a precise amount of mass to the club's periphery, creating maximum forgiveness during off-center hits. Thin Top-Lines: The compact head design features thinner top-lines and progressive sole widths from the short to long irons, offering a more traditional iron appearance. True Temper Dynamic Gold Shaft: Tour proven and meticulously weight sorted True Temper Dynamic Gold shafts in a .355 taper tip help maximize control and accuracy. The all new Ci6 is targeted directly at the mid-handicapper. It looks and feels like a precision players instrument but incorporates some of the more forgiving features of the Wilson Staff line. The mid-size head features thin toplines, slight offset and a small undercut cavity. The perfect blend of classic looks and maximum control,Elastomeric Dampening Layer with Unique cavity coating reduces vibration by 1/,Nano-Tech Graphite Shafts.The most consistent graphite shaft ever, with a stable tip for mid to high launch angles.